Hillingdon has five dedicated, 'one-stop', new-patient clinics. The Breast Unit provides a rapid diagnostic service for women referred by their GP with breast symptoms. 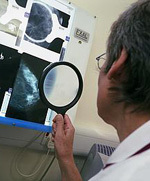 A mammogram and breast ultrasound scans can be carried out during the first clinic visit and information about results may be discussed the same day. Often a biopsy may be required and this is also taken at the first visit. We aim to see a patient-referral patient within two weeks. Women under the age of 30 years will be seen in a NON one-stop clinic. Therefore if any examinations are required, a second visit may be necessary. Fortunately most women attending the breast unit can be reassured as soon as possible that they don't have breast cancer. For others it may not be so, and a breast nurse specialist is available for advice, support and information about treatments, and throughout the recovery process.